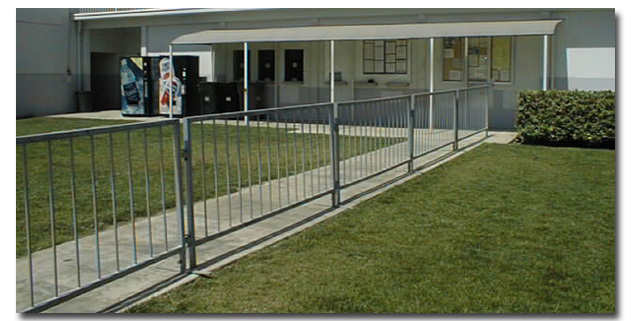 Mike Brown Grandstands offers crowd control products that can be used in conjunction with our seating systems. The MBGS Crowd Control Barricade is a movable. temporary, barrier used to direct the flow of pedestrians and traffic. Each barricade is 8'-0" long and 44" high. They weigh just 75 lbs each and stack vertically for easy transportation (typically in bundles of 25). Our rental inventory contains both painted and Hot-Dip Galvanized CCBs. Fabricated from 1.5" square steel tube the barricades link together to produce continuous connected runs. Also used (sometimes in conjunction with CCBs) to manage crowds, are turnstiles. These devices can be utilzed to control the rate of flow of pedestrian traffic. Available in two different styles, "Box" and "Spider", the MBGS turnstiles are stable freestanding units with cast iron or steel bases. At this time "counters" are not available.